Lens Description: Redesigned with a metal exterior under the Art category, this high-performance standard lens is designed exclusively for mirrorless interchangeable lens cameras and has the equivalent angle of view as a 60mm lens (35mm equivalent focal length) on the Micro Four Thirds systems and 45mm (35mm equivalent focal length) on the E-mount system. Two glass mold aspherical lenses, including a double-sided aspherical lens, provide excellent correction for all types of aberration. The inner focusing system corrects the fluctuation of aberration to maintain image quality regardless of the focal distance. Sigma’s Super Multi-Layer Coating reduces flare and ghosting as well as provides sharp and high contrast images even at the maximum aperture. The superior telecentric optical design improves the image quality throughout the frame. The optical design also allows the lens to be compact and lightweight. This lens benefits from a newly developed linear AF motor, which moves the lens elements directly without the need for gears or the drive of other mechanical parts. This system ensures accurate and quiet autofocusing, making the lens suitable for video recording as well as still photos. 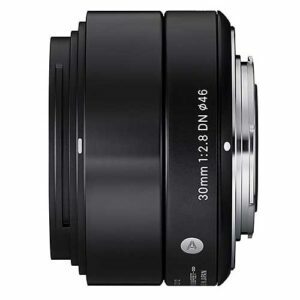 The lens features a rounded 7-blade diaphragm creating an attractive blur to the out of focus areas of the image. This Sigma 30mm f/2.8 DN has a minimum focusing distance of 30cm/11.8in and a maximum magnification ratio of 1:8.1, and comes in either a silver or black finish.